The Lady's Command...we've got Declan, a captain, who marries Edwina, a lady. (Edwina :) The name just cracks me up.) It was an actual marriage of affection and not arrangement, and in the first few weeks of blessed wedded bliss, they realize just how much they enjoy each other's company (wink wink if you get my drift). Declan gets notice that he has to go do some dangerous captain-y business and prepares to leave his new wife who is having none of it. She married a captain and she wants adventure. 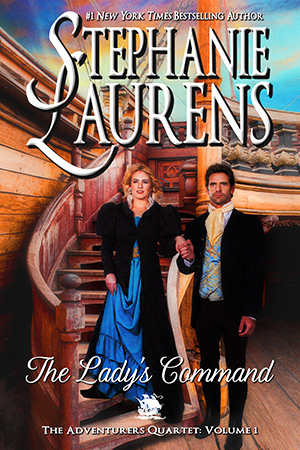 So she sneaks on board his ship and the two sail off to West Africa and intrigue. And here are my thoughts. I don't have a lot of thoughts. This wasn't a poorly written book, but it also wasn't very interesting. It reminded me a bit of Gail Carriger's "Parasol Protectorate" series set in the Regency era with strong-willed women who won't be left behind. But were Carriger's story was filled with humor (and paranormal creatures), Lauren's just felt a bit bland. There was little character development, and to be honest, slow plot development which left reading it just a bit sluggish. And the cover...I just can't with the cover. So what did I learn - Steve West can't save everything for me, which actually makes me feel better because now I know just how spectacular An Ember in the Ashes and Gemina really are. Two of my FAVORITES from 2016 and maybe ever. It was a worthwhile experiment that also let me mark "A genre you don't normally read" off my 2017 reading challenge list (read along here).